After decades of consistent and controlled growth, the past few years have been particularly challenging for Toledo Metal Spinning. To say the company has traveled a rough road to the new millennium would be an understatement. But after a devastating fire in 1998, the company has recovered , rebuilt and have been recognized with a prestigious national award. On February 4, 1998, a raging fire lit up the midnight sky. Fanned by 40 mph winds, it destroyed 95 percent of the firm’s manufacturing equipment and 80 percent of its manufacturing space. After an intensive investigation, the cause was deemed unknown both by the insurance company and the city fire investigators. The loss exceeded $10 million. Included in the destroyed property was more than 70 years of tooling and job development, quality inspection gauges, several brand-new pieces of equipment, and many records, files, and history that can never be duplicated. “I cannot overemphasize how important employee retention was,” he explained. “Our business is very skill-oriented. It took many, many years to train our existing employee base. A good percentage of employees are second- even third-generation workers. It was imperative in order to continue the business that each and every employee was involved in the rebuilding process. 500 job orders were in process for approximately 100 customers. These customers needed a continuous flow of parts to keep their businesses going. 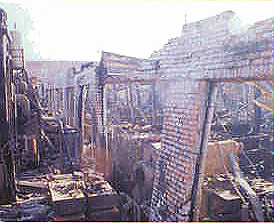 Within 48 hours of the fire, production was resumed on primitive-type machinery. The owners personally called the key customers to make sure relationships were solid. Workers began sifting through the rubble to unbury salvageable tooling. With more than 20,000 pieces of tooling, the company’s challenges included retrieval, cleaning, magnetic particle inspecting and dimensional checking. A temporary office and communications were required. By the last weekend in April, a 6,500 square-foot section of new building was completed and in use, and an additional 12,000 square-foot portion was constructed by the end of July. By September 7, the last piece of machinery was installed and running. Many pieces of equipment were specialized, custom-built machines, delivered from across the globe. Several pieces of large equipment were air freighted in order to accommodate customers’ schedules. Despite the devastating fire, company sales by the end of 1998 had reached 83 percent of 1997 levels, with full recovery anticipated for 1999. 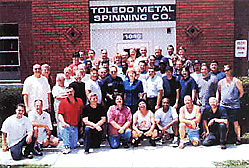 Toledo Metal Spinning is a privately held company, owned by Ken, Craig and Eric Fankhauser. The company processes aluminum, stainless steel, carbon steel, copper and brass, and also forms parts from high tensile and heat-resistant alloys. With complete spinning, stamping, deep drawing, rolling and welding departments, as well as many secondary operation capabilities, the company can proceed efficiently from prototype to production runs.